COLT OHWS (Offensive Handgun Weapon System) "SOCOM" / U.S.A. 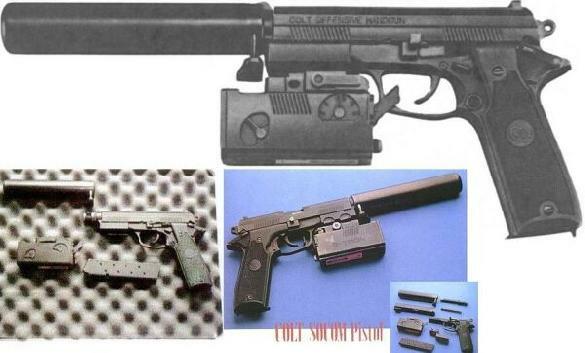 The United States Government began a series of trials in the early 1990's to find a replacement weapon for the aging stocks of M-1911A1 automatics in service still with the nations elite units. There were two major contenders for this title, Heckler & Koch submitted their Mark 23 Model O and Colt submitted their OHWS. Designed to use a double stack column, 12-rounds magazine (a break from prior designs), and firing the .45-ACP cartridge, the weapon is capable of using a suppressor and laser aiming module with internal flashlight. The weapon however was ultimately rejected by the Government and Heckler & Koch eventually began production of their Mark 23 Model O.